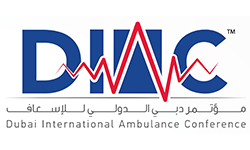 The Dubai International Ambulance Conference (DIAC) is held under the patronage of H.H. Sheikh Mohammed Bin Rashid Al Maktoum, Vice-President, Prime Minister of United Arab Emirates, and Ruler of Dubai and is supported by the Dubai Corporation for Ambulance Services (DCAS) the leading government organization in the field of Emergency Medical Services in the UAE. This event will take place from the 5 – 7 March 2018 at the Dubai International Convention & Exhibition Centre. DIAC 2018 is an event that will largely focus on pre-hospital care where ambulance leaders, senior managers and stakeholders come together to share best practice and ideas on how to improve the way they manage and develop their local services. DIAC 2018 will give personnel at all levels from the urgent and emergency services background to network and to hear from key figures in the industry, public and private sector, ambulance services and health authorities on current / future trends and policy developments.